Can a movie be both interesting and boring at the same time? Funny, yet un-funny? Creative and stupid? If so, this movie encompasses all of it. In a way, I admire the attempt to integrate as many Grimm fairy tales as they did into the plot. It's just that not all of them were readily identifiable and the marriage of fantasy with a real plot is neither seamless or believable. The humor works when it's subtle, but the over-the-top characterizations of French people is cliche and actually sort of offensive. 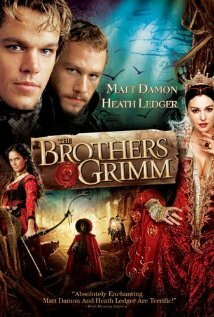 It's also weird to make this movie a comedy, considering how dark the Grimm fairy tales really are. So the movie ends up having really dark events like death and kidnapping, offset with jokes. It's uncomfortable. And another thing...Heath Ledger's accent is really terrible. I know, I know, people seem to think just because he's dead means no one can ever say anything bad about him. He was such a great actor, you say. Just look at his work as the Joker in the Batman movie! But, dear friend, you are handily claiming amnesia on moments like this in Ten Things I Hate About You or the entirety of Casanova. He and Matt Damon are supposed to be German, but their accents fall somewhere in the English/Dutch region. Final word: Taking into account the super crappy CGI, this whole movie feels like a high school film class project. And not one of those upscale artsy schools.